Thursday, August 23 from 6:30 p.m. until 9:30 p.m. 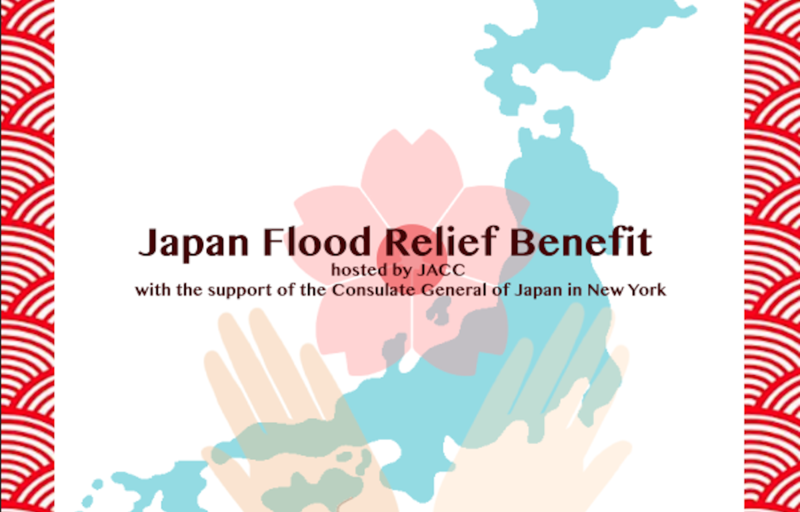 The Japanese American Community Coalition, a consortium of New York-based Japanese American service organizations, is hosting a special fundraiser for flood relief efforts in Western Japan, which has been suffering from historic rainfalls, landslides, and an unprecedented heat wave this summer. This is a collaborative event between many Japanese/Japanese American and Japan-related organizations – Hoshuko Alumni Association, Japanese American Association of New York, JET Alumni Association of New York, Japanese Medical Society of America, U.S.-Japan Council, NY Japanese American Lions Club, and Japanese American Citizens League-NY – with the support of the Consulate General of Japan in New York. Japanese-inspired hors d’oeuvres will be provided courtesy of Chef John McCarthy of OKA, and premium sake donated by World Sake Imports and Skurnik Wines, tea donated by Ito En, wine, and beer will be served (included in the price of admission). Guests will also have a chance to win special, high-end prizes from Hiro Sake, Japan Society, Sakagura, Asia Society, JAA, Sanrio, and more. Net proceeds will go to JAA’s Japan Flood Relief Fund. JAA, the Japanese American Association of New York, is a 501(c)(3) not-for-profit organization. Space is limited, so register early by visiting JACC’s BrownPaperTickets site. A limited number of tickets MAY be available at the door for $85. If you are unable to attend but would like to make a donation, please visit JAA’s website. Please specify that your donation is for the JAA Japan Flood Relief Fund. Kyodo News reports that the torrential rains and landslides that started in early July killed at least 225 area residents and forced more than 3,000 people into evacuation shelters. Your support to those recovering in Japan, especially in the hardest hit areas of Hiroshima, Okayama, and Ehime Prefectures, will be greatly appreciated.